It’s that time of year when people are buying girls gifts – but not wanting to waste their money, many buyers tend to stick to more traditional present ideas. So, here’s a few ideas for anyone looking to get something less stereotypical for a girl, based on things our daughter has enjoyed (or soon will…!) this year. If you get one gift from this list, please make it this one. 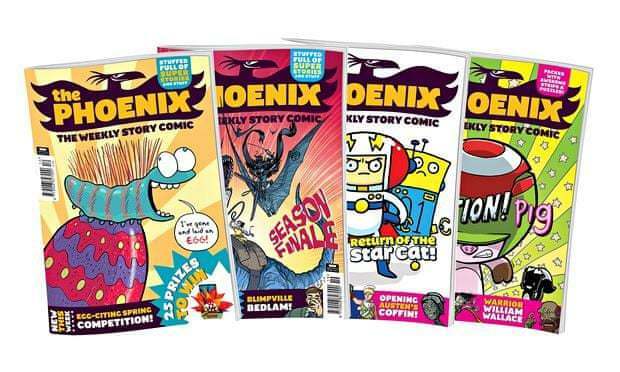 The Phoenix Comic is a weekly British comic, which features a mixture of funny, thrilling, fiction and non-fiction stories and articles. Aimed at kids aged 6-12, we’ve been getting it for the past year and our daughter adores it. Overtly aimed at both boys and girls, the weekly subscription arrives addressed to your child in an eye catching envelope. There is MUCH excitement every Friday after school when the 6yo comes home to find the latest Phoenix waiting for her. There is a 4-issue trial offer for only £1 per issue, and I strongly urge you to try it. For a pricier treat, this Chewbacca toy is part of Hasbro’s FurReal range. This is essentially an interactive cuddly toy, which moves and makes sounds with physical and audio interaction. Star Wars toys have increasingly moved out of targeting exclusively young boys, and is now treated by Hasbro as a unisex brand. Toys such as this one are part of that acceptance that the galaxy far, far away is for girls as well as boys. And if you know a girl who would love a Wookiee as a companion, this is the perfect option. A slightly left-field addition, I actually bought these David Bowie Top Trumps for my wife – but our daughter has been fascinated by them. They have also been a great way to introduce her to David Bowie, when played alongside a playlist of the late musician and style icon’s music. 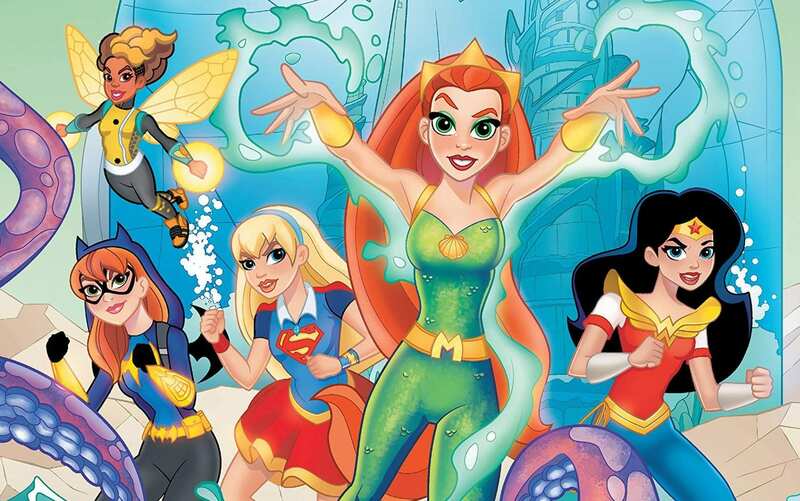 While the LEGO line has sadly been discontinued, and many of the other toys are a bit underwhelming, the comics, cartoons, and books of this line are an excellent choice for young readers – and another way into superhero comics for girls who may think they’re not for them (or even those who do). Our daughter loves them. There are currently two animated formats – the traditional line drawing style, and CGI LEGO version. They’re *fine*, and have gone down well with daughter’s friends which helps her share her love of superheroes – but still, not the most inspiring cartoons. On the way soon however is a brand new look, in a new series run by My Little Pony: Friendship is Magic creator Lauren Faust (as previewed alongside the recent Teen Titans Go! movie – more on that later), which looks great. I’m a bigger fan of the comics and books, which really engage our 6yo daughter to read something aimed at older kids – and hooks her into female centric comics, with storylines exploring themes many girls will experience during school age (and beyond). We’ve hit peak LEGO in our house, so there will likely be far fewer additions after this year. We went out with style however, as our 2018 highlight HAS to be LEGO Voltron. This is a big (and pricey) set, but one that is very inventively designed. Inspired by the cartoons (the 80’s version and current Netflix version), Voltron is a giant humanoid mech, made up of 5 mechanical ‘Lions’. The LEGO version is similarly made up of these separate 5 elements, and what was great about this set was that we could make this together as a family, each constructing separate elements that all join together to make a cool finished set. But – despite what the company may claim – LEGO is not just about ‘the brick’ these days, with the brand diversified onto multiple platforms where kids are spending their time and money – none more so than video games. Two titles we have enjoyed this year are LEGO Incredibles, and LEGO DC Super-Villains. The game formula is getting a bit long in the tooth, but they still remain entertaining enough for now. Books are another medium where LEGO have abundant branded product, but at least the LEGO Star Wars Ideas book actually got our daughter playing with LEGO. It’s full of all sorts of Star Wars related builds, and our daughter loves trying them out and getting new inspiration. The best film of the year (according to our daughter) is Teen Titans Go! to the Movies. For those unaware, this is based on the Cartoon Network show (though we watch it on Prime Video) of the same name. A spin off of the earlier Teen Titans cartoon, it is a fun and irreverent show, which really puts the meta into meta humans. The movie is no different, with gags coming thick & fast. Particularly of note are those aimed at the DCEU movies, eg. when Batman & Superman fight because their dads have different names! The 6yo’s second favourite movie of the year was Marvel’s Black Panther, which is a good choice as it’s probably one of Marvel’s best movies. This role play gear has proven to be popular not only with our daughter, but her friends when they come over for playdates – especially the girls (none of whom have seen the movie yet, but think the toys are cool). The mask lights up, like the movie version charging with energy, and the claw makes swishing and clawing sounds as it is moved about. This being Hasbro, they have to shoehorn their NERF dart shooter into something, and here it is T’Challa’s inventor sister Shuri’s shooter – which is pretty cool. I bought our daughter her first Squirrel Girl comic pretty much sight unseen, just based on the number of female comic fans who seem to enjoy her adventures. Well, good call as daughter LOVES her! The mixture of fun adventures, a delightful character, great supporting cast, and LOTS of humour (inc. with other Marvel heroes – the headliners all make appearances) have made this possibly her favourite comic. A selection of 50 of the women and girls covered in the two volumes of Good Night Stories for Rebel Girls are presented here in a series of high quality postcards. They are presented as a kind of mini filing cabinet, with the 50 women divided into categories such as Leaders, Champions. or Creators. Like with many well made and presented postcard sets, while I guess you could send them – it seems a shame to not keep them as a set.